I monitor many devices and services with PRTG which are responsible that the whole email system of my company works properly. 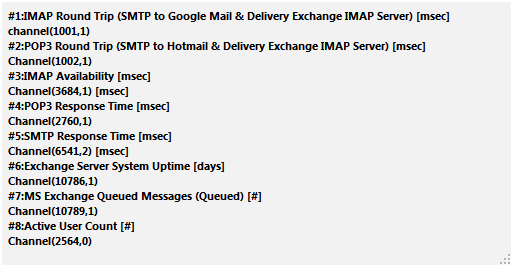 This includes, for example, POP3 and IMAP email servers, email round trip times, dozens of Microsoft Exchange database performance counters, the internet connection, traffic, and many more related parameters. This creates a lot of sensors and is because of this way too detailed to be shown to my management and non-technical co-workers. How can I get only one overall status for the whole process “email” to see at a glance if the email system works or not? When thinking about how to ensure email delivery, many services and components in your IT infrastructure will come into mind which you might want to monitor. You can monitor these with various sensor types in PRTG. From POP3 and IMAP over system hardware and bandwidth to the details of an Exchange server regarding connections, queues, latency, connections, users, etc.—the sensors of PRTG show you the current states and values of all of them. One reason for this detailed monitoring is to be able to act before mail server failures occur rather than react after a whole server outage. Only a few minutes that you are not available via email can cost your company a lot of money! But how to get an overall status for all these essential email process components whose monitoring data is potentially distributed over your device tree? A possible solution is the Sensor Factory Sensor. The following step-by-step guide will show you how to create a Sensor Factory in order to monitor business processes. As a sample use case, we explain how to monitor (parts of) the email process in your company as a whole. You can take the particular steps and examples below as a baseline and adapt them to your own application scenario. The Sensor Factory sums up the states of various sensors as you need it. Basically, you just have to provide the “address” of the sensor channels you are interested in and the Sensor Factory uses these channels then as its own channels. Furthermore, you have to define the Error Handling for the sensor. This way, you can specify exactly when the overall status of your email process will show an error. Then you are able to publish one corresponding status icon for your colleagues. Decide which sensor channels you want to include into your Sensor Factory. An idea of which sensors you might want to cumulate into one common status is given above. You need the IDs of these sensors and their corresponding channels first in order to create the channels for the Sensor Factory; they define the “address” of a channel. So look for these IDs in PRTG’s device tree. channel IDs are given in the respective channel settings. Note down these two numbers and insert them into the Sensor Factory’s Channel Definition field as described below. You do not need more to create the channels of a Sensor Factory than these two IDs. Of course, you have to repeat the task for all other desired channels for the overall email process status. Add the sensor type Sensor Factory to any suitable device in PRTG, e.g., the local probe device. Define the channels. You can create up to 50 channels in one Sensor Factor—we do not recommend more due to performance considerations. Note: It is not possible to create a Sensor Factory for other Sensor Factory sensors. If you need data from more channels, you can create several Sensor Factory sensors and combine them by using the SensorStatus sensor (PRTG Tools Family). Put all sensor and channel IDs together to create channels in the Sensor Factory as indicated in the previous step, each channel definition in a new line. See the manual for details. Note: The [unit] is optional (you can define any string), as well as you can use any text for channel names. Now that you have identified which sensors and which of their channels are important for a successful email process status and provided them for the Sensor Factory, you can specify when this overall status will go red or yellow (i.e., Down or Warning). 3) Error Handling: When Is the Email Status OK? The easiest way to define an error (or warning) status is to use the predefined options: when at least one source sensor (the sensors whose channels you use in the Sensor Factory) is Down, your “Email Process” (Sensor Factory) sensor will go down (or warning respectively). Depending on the channels you have created, i.e., only the essential ones for the process functionality, this option would be fine. Optionally, you can define an error status more precisely. For this purpose, use the Status Definition field of the Sensor Factory settings. Let’s assume, regarding our example, that it would be okay for the “public” status if at least one of the mailbox sensors works fine (i.e., either the POP3 or the IMAP mailbox is reachable). Then you can achieve this with PRTG’s status() function and Boolean expressions. The status() function only needs a sensor ID to get the status of a sensor. Basically, the Boolean AND means that all sensor states connected have to be down to set the Sensor Factory to Down. The status(<sensorID>) function determines the status of the sensor whose ID you provide as parameter and is resolved to true if the sensor status is Down. You can also use the logical OR and NOT. For more details about how to use the status() function, please see the manual. You have defined the sensors, channels, and error states for your email process to get a one-look view of its condition in only three steps. Then make this status public to concerned persons. Show them the green gauge of your created Sensor Factory with the Message: Email Process OK directly on the dashboards in your office! You can achieve this with PRTG Maps. Just open a new or already existing map with the Map Designer and add the Status Icon for your email Sensor Factory. Then publish your Map. For details, see the manual. Now you can view and show an overall status that indicates if all elements of the business process “Email” are up and running. Green: Everybody, including “non-technical” staff, knows that the email system is working properly. Red: There are currently issues with the email system, no need to tell the administrator that no emails are coming in. He already knows it due to the big red icon on the wall. Yellow: There might be delays in the email system but it still works. This tutorial is intended to give you a starting point on how to create a sensor for monitoring a “business process”. We demonstrated the usage regarding one important part of the business processes in your IT infrastructure: emails. You can apply and adjust this basic approach to a more detailed “overall status” of your email system and, of course, to many other business processes. Find more details about the Sensor Factory in our manual and start monitoring your business processes with PRTG now! Find a short answer on what you can do with a Sensor Factory sensor in the Paessler Knowledge Base. Read about Monitoring Business Processes and the Real Business Impact of Technical Outages (including an example of the business process Online Shop) in our Paessler Blog.